Show your support for our law enforcement professionals by wearing our Thin Blue Line Dog Tag. 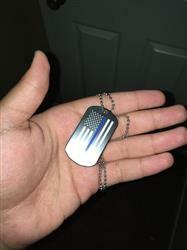 The military style dog tag is stainless steel with matte black finish and vertical Thin Blue Line Flag design, printed on one side. Bought this for my son's (police officer) dog. His dog has a Thin Blue Line Harness with a think blue line velcour flag attached, so we put this thin blue line dog tag on the harness too, looks great. It's awesome I love showing it off! Love all of the items I've purchased from you!